There are sixteen nutrients that are essential for plant growth and development. Thirteen are absorbed by the roots. After taken in by the roots, the nutrients move into the plant and are used for various functions and processes. Nutrient absorption and utilization is not a simplistic process. There are essentially two phases. First, the nutrient must reach the root surface. Then, it must move into cells of the plant. The discussion that follows will focus on movement to the root. Plants don’t necessarily grow in search of plant nutrients. Nutrients must get to the plant root to be absorbed by the large number of root hairs. Root hairs live in association with a diverse group of fungi called mycorrhizae which aid the movement of a nutrient from outside to inside of the root itself. There’s general agreement among plant physiologists that there are three mechanisms by which nutrients reach the surface of the root hairs. These are: 1) root interception, 2) mass flow, and 3) diffusion. Soil particles of various sizes (sand, silt, clay) with organic matter acting as a glue are formed into soil aggregates of various shapes and sizes. These aggregates contain most of the plant nutrients. However, in growth and development, plant roots come in contact with a very limited of soil surface within the aggregates—about 1% to 2%. Roots usually grow around the soil aggregates and don’t grow into them. Thus most plant roots don’t contact a large percentage of the very extensive surface of the soil aggregates. Therefore, the process of roots making direct contact with soil aggregates (root interception), although important, can’t be a major mechanism for nutrients to reach the surface of the root. Driven by the physiological process of transpiration (water loss through the leaves), water moves from the soil pores into the plant root. The soil water contains three negatively charged ions of nitrogen (nitrate), sulfur (sulfate) and boron (borate). All of the water in soils is not used by plants. Likewise, all of the negatively charged ions in this water will not be used by plants. Some of the water and the nutrients contained in this water moves below the root zone. This process is referred to as leaching. Many of the concerns about environmental quality revolve around leaching. 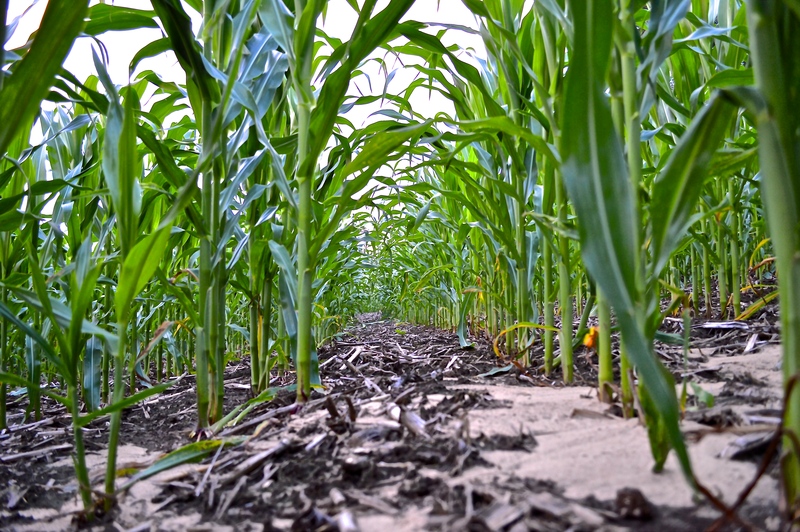 By monitoring nutrients in water in tile lines and water moving through sandy soils, the Discovery Farms-Minnesota initiative is measuring the amount of water and, especially nitrogen, that moves below the root zone. The quantity of these three nutrients that reach the root surface via mass flow is not a constant value. There are several management practices that affect water use by plants as well as the amount of nitrate, sulfate, and borate in this water. For the essential nutrients that have a positive electrical charge when dissolved in the soil water, the major mechanism of nutrient movement to the root surface is the very slow process of diffusion. The positively charged nutrients are potassium (K+), calcium (Ca++), magnesium (Mg++) and the micronutrients except for boron. These positively charged nutrients are associated with the clay component of the soil aggregates. Using a chemistry definition, diffusion is the movement of a nutrient ion from an area of high concentration to an area of lower concentration. In soil system, the surface of the root is usually considered to be the area of lower concentration. The surface of the clays in the soil aggregates is thought to be the area of high concentration. Therefore, the positively charged nutrient ions diffuse from the surface of clays in the soil aggregates to the surface of the root. Nutrient uptake by plants keeps the concentration at the root surface low. There are several management practices that can affect diffusion. Some of the most important are percentage of clay size particles in the soil, the rate of nutrient applied in a fertilizer program, and the placement of the fertilizer (band or broadcast). Diffusion is slow but continuous as long as the plants are growing. Movement of nutrient ions to the surface of the root is complex. There are no rules that govern the magnitude of each of the three mechanisms. There are several management practices that are related to water utilization as well as fertilizer use that affect this movement. The essential nutrient, phosphorus, has not been included in the previous discussion. It exists in the soil water as one or both of the phosphate ions (HPO4, H2PO4). These are the phosphate ions absorbed by plants. Unlike nitrate (NO3-), however, they do not flow as mass flow because they interact with calcium, magnesium, iron and aluminum to form insoluble compounds. All of the phosphorus is not insoluble. There is always some that moves to the root surface by diffusion. Measurements from the fields in the Discovery Farms program in both Minnesota and Wisconsin show that phosphorus can leave the landscape attached to soil particles or dissolved in runoff. The total phosphorus losses are usually less than 2 lb/ac. There will be a more detailed discussion of the chemistry of phosphorus in soils in a future publication on this web site.